Back on June 11, 1930 three members of the American Meteor Society (AMS) in Maryland saw a half-hour-long bright outburst of meteors from the little constellation Delphinus the Dolphin. No one had predicted the shower, but it came out of nowhere and hasn’t been seen since. Attempts to catch a repeat performance in subsequent years met with no success. The expected time of maximum activity is 4:30 a.m. Eastern Daylight Time, 3:30 a.m. Central, 2:30 a.m. Mountain and 1:30 a.m. Pacific. 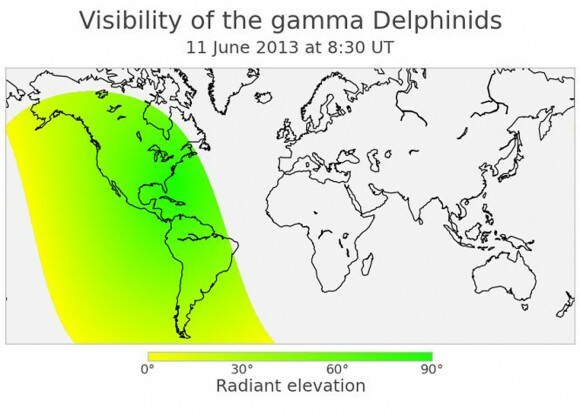 These times are ideal for the Americas where Delphinus is high in southern sky at the peak time. Robert Lunsford of the AMS recommends starting your Gamma Delphinid vigil 2 hours ahead of time in case the shower’s early. If these meteors really do happen, you’ll see them anywhere in the sky, but they’ll all trace back to a point near the star Gamma Delphini in the dolphin’s nose. Tonight June 10-11 from 10 p.m. – 2 a.m. CDT, Dr. Bill Cooke of NASA’s Meteoroid Environment Office will take your questions via live web chat. He’ll offer viewing tips about the shower and include a live Ustream telescope view of the skies over Huntsville, Ala. If you shoot video or images and want to help improve our understanding of this elusive meteor shower, you can upload them to the Office’s Flickr group and also to Universe Today’s Flickr group. We’ll post images if this meteor shower proves to show up! There’s something right fishy about the photo displayed of the Eta Aquariids: There’s no way that these three meteors came from the same radiant. In fact, no two of them appear to have come from the same radiant. Photoshopped?